The soft pastel hues spanning the sky above the railway tracks in the town of Morse, Saskatchewan, light up the prairie landscape with no end in sight. Green vegetation grows between the long stretch of railway tracks which travel across the prairie landscape, this particular picture taken in the town of Morse, Saskatchewan. These railway tracks are part of the Canadian Pacific Railway which span the distance from Vancouver, Canada across the prairie provinces until reaching Montreal, Quebec. Chicago, Minneapolis and New York City in the United States also rely on the Canadian Pacific Railway. The town of Morse, Saskatchewan is very small with a total of about 250 permanent residents and as the trains pass through town, the sound of the whistle can be heard for miles across the landscape. While stopping in the town of Morse, the cylinders at the grain elevators are emptied into the railway cars where it is taken to ship terminals throughout Canada and then transported to other countries. Picture of the railway tracks running across the prairie landscape in Morse, Saskatchewan. Flat land with no mountains in sight is what the prairie landscape is made up of. Above the railway tracks which disappear off into the horizon, the skies light up in various colors at sunrise and sunset. 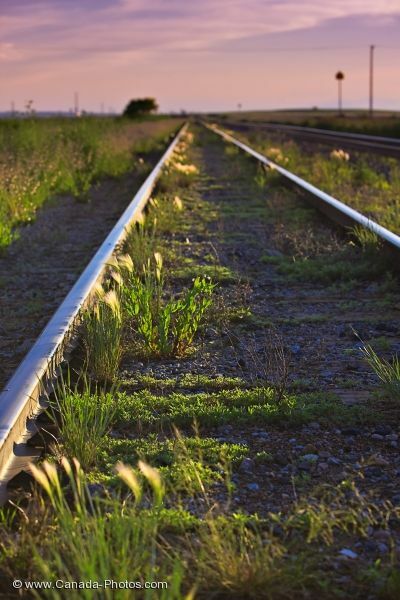 Railway tracks in the town of Morse, Saskatchewan, Canada.